This book addresses the questions of what went wrong with Detroit and what can be done to reinvent the Motor City. Various answers to the former-deindustrialization, white flight, and a disappearing tax base-are now well understood. Less discussed are potential paths forward, stemming from alternative explanations of Detroit's long-term decline and reconsideration of the challenges the city currently faces. Urban crisis-socioeconomic, fiscal, and political-has seemingly narrowed the range of possible interventions. Growth-oriented redevelopment strategies have not reversed Detroit's decline, but in the wake of crisis, officials have increasingly funnelled limited public resources into the city's commercial core via an implicit policy of "urban triage." The crisis has also led to the emergency management of the city by extra-democratic entities. As a disruptive historical event, Detroit's crisis is a moment teeming with political possibilities. 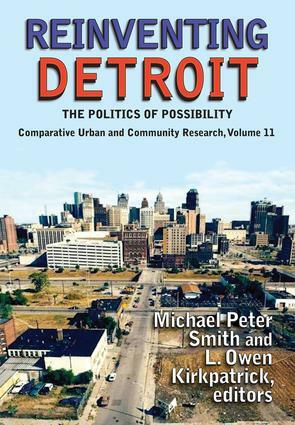 The critical rethinking of Detroit's past, present, and future is essential reading for both urban studies scholars and the general public.